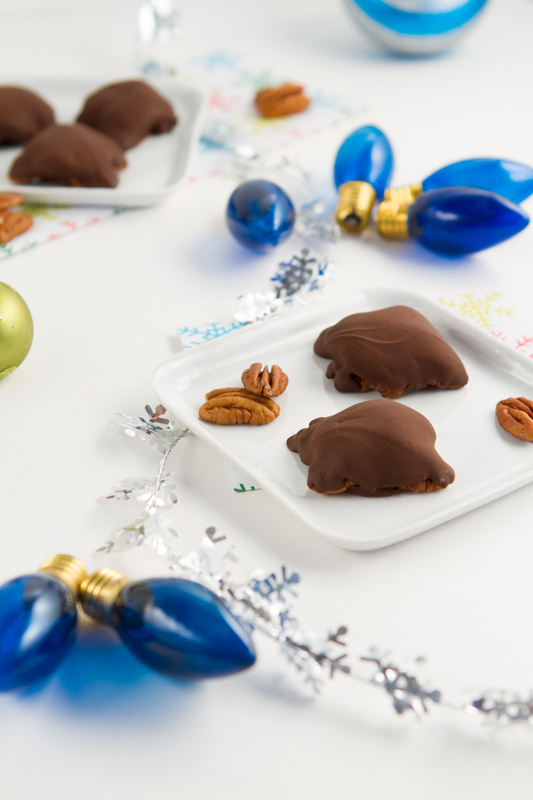 This no bake recipe is super simple, has 3 ingredients, and is made with limited refined sugars making it a much healthier way to enjoy our ultimate Christmas favorite, Nestlé Turtles. Cut medjool dates in half lengthwise and remove pits. Shape each piece into a circle with your fingers. The dates should be squishy enough that this will be really, really easy to do. Lay the date circles on a parchment paper lined baking sheet, sticky side up. Press 4 pecan halves into the center of the date circles, fanning them out to look like a flower. Melt chocolate chips in a double boiler or saucepan with a bowl over top. Spoon 1/2 teaspoon of melted chocolate into the middle of the fan of pecans. 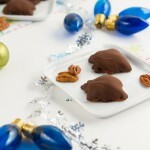 Flip the turtle over and press down gently so that the chocolate touches the parchment paper. Repeat with remaining date circles and place in the freezer for 5 minutes to harden. You can keep the chocolate warm my placing back in the hot water bath. Drop each turtle into the melted chocolate and move around until it’s back is covered. Remove from the bowl and place back on baking sheet. Repeat with remaining and let cool in the freezer for 10 minutes for the chocolate to harden. I highly recommend using medjool dates over honey dates because they’re a lot more pliable. Feel free to use any nut you have on hand. You could also try making your own chocolate (with equal parts melted coconut oil, sugar and cacao powder) and using it instead of store bought.